You will need to make sure that your dog is registered with the kennel club (insert link) prior to measurement and that your dog is microchipped. Two measurers are required for a measurement of a dog to be valid. 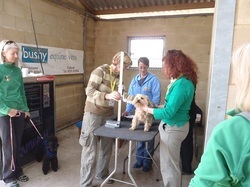 Where a dog is measured as small or medium they must be measured again between 12-24 months from the date of first measurement to ensure that they do not grow and move into a larger height category. If the dog at the second measurement is deemed to be a different category then a third measurement will need to take place within two calendar months by two different measurers. Measurement of the dog's height is from the ground to the hightest point on the dog's withers. It is the owners responsibility to ensure that the dog is under control to allow for measurement to take place. If you would like to dispute the measurers decision you can appeal to the Kennel Club within 30 days with a written statement describing the grounds of the appeal. The owner must ensure that they bring their offical record book stating the dog's height and grade to all shows and maintain results within their record book. Please note that to compete in England and N Ireland you will need to be measured by English Kennel Club measurers in addition to the above.